Court of Session rules Law firm should face £28m writ proof. A RULING by Court of Session judge Lord Doherty has paved the way for a proof hearing of a multi million pound damages claim against Glasgow based law firm Levy & McRae - for their role in connection with a £280m collapsed hedge fund. Current and former partners of law firm Levy & McRae who were named in the writ – including among them suspended judge Peter Black Watson (62) - now face a potential claim of up to £28million from Paul Duffy of Ernst & Young – the liquidators of collapsed hedge fund Heather Capital. Allegations against numerous individuals were made before Lord Doherty in the Court of Session during a case which ran for several weeks. This week, the Sunday Mail newspaper reported that “Pursuers including liquidator Paul Duffy say £19 million was paid from the firm’s client account to Panama-registered Niblick Investments SA – owned and controlled by jailed fraudster Nicholas “Beano” Levene. They claim the money had been sent from Heather Capital’s bank account to Levy & McRae on January 4, 2007, and transferred to Niblick five days later. A second payment of £9.412 million was sent from Heather Capital to the firm’s client account before being transferred on to a firm of Gibraltar-based solicitors. The liquidators’ case alleges King “created the false impression” that these companies had themselves entered into loan agreements against property with other Gibraltar firms. The pursuers go on to state: “In fact, the money was never paid to them. It was instead paid out to third parties, undocumented and without security, out of various solicitors’ client accounts in which it had been deposited. Lord Doherty’s opinion ruled liquidators should not be time barred in bringing a case. The list of current & former Levy & Mcrae partners named in the multi million pound claim also include the solicitor & suspended sheriff – Peter Black Watson – who was suspended from the judicial bench by Scotland’s top judge Lord Gill. Lord Gill suspended Sheriff Peter Black Watson in February 2015 - after demanding sight of a multi million pound writ against Glasgow law firm Levy & McRae – where Watson was formerly a partner. 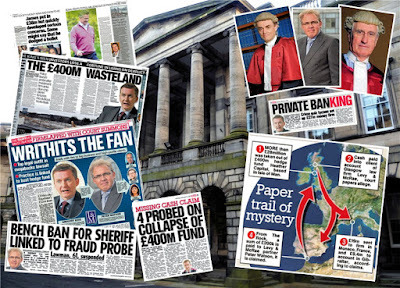 This week, the Sunday Mail also revealed the Crown Office & Procurator Fiscal Service (COPFS) – now led by Lord Advocate James Wolffe QC – is yet to act after a three year probe initiated by Wolffe’s predecessor – Frank Mulholland QC following the police probe into Heather Capital and Mathon Finance. Marbella based Gregory King, lawyer Andrew Sobolewski, 57, of Bridge of Weir, Renfrewshire, accountant Andrew Millar, 63, of Cambuslang, near Glasgow, and property expert Scott Carmichael, 44, of Thorntonhall, near Glasgow, were named in the police report on Mathon sent to the Crown Office in April 2013. Wolffe’s predecessor – Frank Mulholland – who stepped down from post of Lord Advocate without making a decision on the Heather Capital case – was recently appointed as a judge at the Court of Session - by current Lord President Lord Carloway (real name – Colin Sutherland). The Crown Office have so far declined to say whether any action would follow against any of the four. The pursuer is a company (“HC”) in liquidation and its liquidator. The liquidator was appointed on 7 July 2010 by order of the High Court of Justice of the Isle of Man (HC was incorporated in the Isle of Man). The defenders are a firm of Scottish solicitors and the partners or former partners of the firm. In this commercial action the pursuer seeks redress from the defenders on a variety of grounds. The matter came before me for a debate. The principal issue debated was whether the court could determine without further inquiry that each of the obligations upon which the pursuer founds has been extinguished by prescription. The defenders also maintain that certain of the pursuer’s averments are irrelevant. The debate took up two and a half of the three days which had been allocated for it. Notes of argument had been prepared in advance. These were supplemented with oral submissions, and there was reference during the course of the debate to productions which had been lodged in a joint bundle. However, there was no joint minute relating to the productions and no agreement renouncing probation in respect of them. The following is a summary of the pursuer’s averments. Some of them are disputed. Since they include allegations of impropriety against several people it is important to emphasise that they are averments and not established facts. Thus, for example, Mr King has not been the subject of any criminal proceedings. However, for the purposes of the debate the pursuer’s averments require to be taken pro veritate. HC and its investors were defrauded by the diversion of invested funds exceeding £90 million (including £28.412 million which HC had entrusted to the defenders) under the guise of fictitious loans to various shelf companies incorporated in Gibraltar. The mechanism of the fraud was essentially the same in each case. A number of companies, owned and/or controlled by a director of HC, Gregory King, were incorporated in Gibraltar. HC then entered into credit facility agreements with those companies (the “first-level special purpose vehicles” (“first-level SPVs”)), each agreement being secured by a debenture granted by the first‑level SPV. Mr King created the false impression that the first‑level SPVs had themselves entered into loan agreements with other special purpose Gibraltar companies (the “second-level SPVs”) and that the loans to the second-level SPVs had been secured against heritable property. On the information available to it, HC recorded loans to the first-level SPVs in its books of account. In fact, the money was never paid to them. It was instead paid out to third parties, undocumented and without security, out of various solicitors’ client accounts in which it had been deposited. Mr King and Santo Volpe (a co-director of HC) were co-conspirators in the fraudulent diversion of HC’s funds to third parties such as Nicholas Levene or companies owned and controlled by him or by Mr King, in contravention of the strategy and principles set out in HC’s investment particulars. On 4 January 2007 £19 million was transferred from HC’s bank account to the defenders’ client account. On 24 January 2007 a further £9.412 million was transferred from HC’s bank account to the defenders’ client account. The pursuer avers that HC was the defenders’ client; and that esto HC was not their client the defenders nevertheless received and held the payments on its behalf. So far as HC was concerned each of the two payments was to be loaned to a first-level SPV, Westernbrook Properties Limited (“WBP”), once loan and security documentation had been executed; and WBP was to on‑lend it to a second-level SPV once a loan agreement had been executed and security over heritable property obtained. In fact the monies were never paid to WBP. On 9 January 2007 the defenders paid the £19 million to Niblick Investments SA (“Niblick”), a Panamanian company owned and controlled by Mr Levene. On 29 March 2007 the defenders transferred the £9.412 million to a firm of Gibraltar solicitors, Hassans, under the reference Rosecliff Limited (a company controlled by Mr King). In each case at the time of transfer the transfers were “undocumented, without security, and contrary to the strategy and principles set out in HC’s investment procedures”. Early in 2007 HC’s auditors (KPMG Audit LLC (“KPMG”), the Isle of Man member firm of KPMG International Co-operative) raised questions about the propriety and recoverability of loans by HC to the first‑level SPVs. In a memorandum dated 17 March 2007 KPMG identified concerns relating to the documentation provided in respect of loans by the first-level SPVs to second‑level SPVs. KPMG suggested that further work should be undertaken and that additional information was required. After KPMG had flagged up concerns Mr King and Mr Volpe compounded the fraud by taking steps, from March 2007 onwards, to conceal the true use of the funds, and to create the false impression that the fictitious loans had been repaid to HC between April and June 2007 by the first-level SPVs. Between April and June 2007 Mr King instructed additional funds to be transferred from HC to Mathon Limited (“Mathon”) and Bathon Limited (“Bathon”). Fictitious loans were created by Mathon and Bathon to give the appearance that those funds had been advanced to legitimate borrowers. In fact the funds were transferred to Cannons Law LLP (‘Cannons’). Cannons were instructed by Mr King to send payments to HC for amounts equivalent to the purported outstanding loans to (all but two of) the first‑level SPVs. Cannons later stated to HC’s board of directors and KPMG that they had acted on behalf of the first‑level SPVs when making the repayments. This gave the false impression that the loans to the first‑level SPVs had been repaid whereas in fact the “loans” (including the “loans” to WBP) were “repaid” by using HC’s own funds. The board of directors of HC investigated the concerns raised by KPMG. A board meeting was held on 6 September 2007. Mr King and two non‑executive directors (John Bourbon and Robin James) were present and the company secretary, Andrew Ashworth, and David McGarry of KPMG were in attendance. Mr King advised that Mr Volpe had executed loans to SPV companies where non-standard procedures had been followed, inadequate security had been given for some loans, and relevant accounting records had not been obtainable from Cannons. Mr King stated that the loans to the SPVs had been repaid in full in May 2007. Mr Bourbon sought to meet Mr Volpe to investigate matters but Mr Volpe refused to co-operate. Later the same month Mr Bourbon met with Joseph Triay of Triay & Triay, Solicitors, Gibraltar to try and obtain information about the loans made by HC to the first-level SPVs. Triay & Triay refused to provide access to the books or records of the first‑level SPVs without Mr Volpe’s consent. Following a resolution at a board meeting of HC on 1 October 2007 Mr Bourbon, Andrew Beeman (another non‑executive director), and Mr Ashworth attended a meeting with the Isle of Man Financial Services Commission (the “FSC”) to discuss “the issues”. On 8 October 2007, Mr Bourbon emailed Mr Triay asking whether he had contacted Mr Volpe to obtain authority to release the documents which he had requested at the meeting in Gibraltar. On 10 October 2007 Mr Beeman made a disclosure of suspicious activity to the Isle of Man Financial Crime Unit (“FCU”). The subject of the disclosure was Mr Volpe, and it narrated the efforts made by the non-executive directors to seek further information about the SPVs and the obstacles they faced from Mr Volpe and Cannons. The FCU acknowledged the disclosure on 12 October 2007 and indicated that it would carry out its own enquiries. This process did not disclose the fact that HC’s funds had been diverted to Mr Levene, Niblick, Rosecliff Limited or Mr King and that HC had accordingly suffered a loss. On 18 October 2007, the FSC wrote to the directors of HC and asked to be kept informed of the situation. On 26 November 2007, Mr King wrote to HC’s board of directors admitting that “an element of fraud” had been introduced into HC’s investment strategy. Mr King blamed the fraud on Mr Volpe (who had by that time resigned as a director of HC) and Cannons. Mr King falsely represented that the fictitious loans had been repaid. The risk of fraud increased to high as a result of the documentation issues surrounding the SPVs, where some form of fraud appeared to have been attempted. • Full audit of Mathon and Bathon accounts to 30 September 2007. (All monies were invested in these companies as at 30 September 2007). This audit was undertaken by their auditors, Gerber Landa & Gee, in accordance with ‘group’ audit instructions from us. As part of this work, they were instructed to perform a 100% circularisation and credit review of all significant loans. … It was also decided by DKM, MJF and ND to undertake an audit of the nine month figures to 30 September 2007, in order to audit the receipt of monies in relation to the SPV loans and their subsequent reinvestment to assist with signing the 31 December 2006 accounts. “During the accounting period to 31 December 2006 £38,950,000 was advanced to 6 Gibraltar based special purpose companies (“the SPCs”); £41,269,250 was outstanding as at 31 December 2006, including amortised discount. The lending to the SPCs was effected using standard documentation between the Company and the SPC borrower. The SPCs have related party shareholders and directors - see note 10. There is uncertainty as to where the monies lent to the SPCs were then subsequently invested. Loan and security documentation was produced in support of this onward investment by a firm of lawyers. This documentation purported to show that the monies had been on-lent to a number of further Gibraltar incorporated special purpose companies, owned by the underlying borrowers, and secured on property. This documentation could not be validated by the auditors. Amounts equivalent to the outstanding balances on the loans to the SPCs (including accrued interest) were received in full during the period between April and June 2007. With the exception of an amount received from the Promoter (see below), the Directors have been unable to ascertain the source of these repayments which were made via a lawyer's client account. The funds received included an amount of US$5,333,100 from Sargon Capital Limited, the Promoter - see note 10 regarding related party transactions. The Directors are satisfied, having taken legal advice that the funds that have been received have been properly applied in repaying the SPC loan balances and are free of any encumbrance. KPMG’s audit report opinion in the 30 September 2007 accounts contained substantially the same qualification. On 6 June 2008, KPMG signed their audit report opinion on HC’s accounts for the period ended 31 December 2007. The audit report opinion repeated the qualifications concerning the SPV loans with reference to the comparative 2006 figures. On 5 September 2008, KPMG signed their interim review report on HC’s interim accounts for the 6 month period ended 30 June 2008. On 12 May 2009, KPMG signed their audit report opinion on HC’s accounts for the 12 month period ended 31 December 2008. Neither of those reports contained an audit qualification. In 2009 the Serious Fraud Office in England and Wales opened an inquiry into Mr Levene’s business affairs, as a result of which he was charged with, and pled guilty to, fourteen counts of fraud, false accounting and obtaining money by deception. On 5 November 2012 he was sentenced to thirteen years’ imprisonment. Following his appointment on 7 July 2010 the liquidator (assisted by staff from the Fraud Investigations and Dispute Service at Ernst & Young LLP) sought to reconstruct HC’s affairs and account for the losses HC and its investors sustained. The process of identifying the destination of the funds commenced in February 2011. It included a detailed review of electronic documentation recovered from various sources. In around June 2012, the liquidator’s team identified documents which indicated that the payments of £19 million and £9.412 million had not been lent on to second level SPVs but had instead been paid to Niblick and Hassans. This was confirmed on 31 August 2012, when the defenders produced copies of their client ledger to the liquidator as part of a response to a request for information made by the liquidator under section 236 of the Insolvency Act 1986. The pursuer’s case against the defenders is presented on a number of alternative bases. The primary remedy sought is for an accounting by the defenders to it of the whole of their intromissions from 1 January 2007 to 30 June 2007 with HC’s funds received by them into their client account, and for payment of any balance found to be due. The pursuer avers that the defenders held those funds in trust for it, and that they paid away £19 million to Niblick and £9.412 million to Hassans in breach of trust (conclusion 1, Cond. 25‑28, and the pursuer’s fourth plea‑in‑law). Failing an accounting by the defenders the pursuer seeks payment of £28.412 million (conclusion 2, Cond. 28, and the pursuer’s fifth plea‑in‑law). Alternatively it seeks payment of £28.412 million by way of restoration of the value of trust property in respect that the payments were wrongly paid away in breach of trust (conclusion 3, Cond. 25‑27 and 29, and the pursuer’s sixth plea‑in‑law). Alternatively the pursuer seeks damages of £28.412 million on grounds of the defenders’ breach of trust et separatim breach of fiduciary duties et separatim breach of contract et separatim fault and negligence et separatim dishonest assistance. The defenders maintain that all of the obligations upon which the pursuer founds have been extinguished by the short negative prescription. The pursuer maintains that the obligation of accounting for trust funds et separatim the obligation to restore the value of the trust property paid away are not obligations to which the short negative prescription applies: that while they are both prescriptible obligations they are subject only to the 20 year prescription. In relation to the obligations which are subject to the short negative prescription, the pursuer maintains that they have not been extinguished. It avers that it was not aware of having sustained loss until after the appointment of the liquidator, and that it could not with reasonable diligence have been aware that it had suffered a loss until less than five years before the action was raised (Prescription and Limitation (Scotland) Act 1973 (“the 1973 Act”), section 11(3)). It also avers that a period when it was in error induced by the conduct of the defenders should not be reckoned as part of the prescriptive period (1973 Act, section 6(4)(a)(ii)). I shall examine these averments more closely later. As one would expect, there was much common ground in relation to the law. It was accepted that the pursuer’s claims for damages for breach of trust, breach of contract, fault and negligence, breach of fiduciary duties, and dishonest assistance were founded upon obligations to which the short negative prescription applied; and that prima facie those obligations had been extinguished by prescription unless the running of the prescriptive period had been postponed by virtue of section 11(3), or a period was not to be reckoned as part of the prescriptive period because of the operation of section 6(4)(a)(ii). Parties were at odds whether the obligations underlying the pursuer’s claims (i) for an accounting for trust funds and (ii) for restoration of the value of trust property paid away were obligations to which section 6 applied. In relation to these two obligations Mr Duncan submitted that the defenders’ plea of prescription should be sustained and the action should be dismissed. Cases such as Barns v Barns’ Trs (1857) 19 D. 626 demonstrated that prior to the 1973 Act obligations of a trustee to account for trust funds and to answer for transactions carried out as a trustee prescribed under the old long negative prescription. In the present case the defenders had produced accounts ‑ the client account ledger showing the payments in and out. While as a matter of averment the pursuer sought an accounting for trust funds in reality the claim was truly one for reparation for breach of trust. Obligations to make reparation for breach of trust were obligations which were subject to the short negative prescription: 1973 Act, Schedule 1, paragraph l(d), and Clark's Judicial Factor v. Clark's Executors  CSOH 53 per Lord Burns at paragraph 132. So far as the claim for restoration of the value of trust property was concerned Mr Duncan submitted, without developing the submission, that Hobday v Kirkpatrick’s Trustees 1985 SLT 197 was a doubtful decision which should not be followed. In any case, Hobday was distinguishable on two grounds. Any trust here would have been a trust which was incidental to a commercial transaction the terms of which were governed by contract, as distinct from a traditional trust. Further, if the obligation here was not one to make reparation it was one to which paragraph 1(g) of Schedule 1 applied. Moreover, even if section 6 did not apply to an obligation to restore the value of trust property the reality here was that the claim was really one for reparation for breach of trust. The transactions in question had long ago been completed, any trust which may have existed was no longer in existence, and there was now no entitlement to have the trust fund reconstituted. In such circumstances there was no right to restoration of the value of trust property, only a right to damages for breach of trust. The observations of Lord Reed in AlB Group (UK) plc v Mark Redler & Co Solicitors  AC 1503 at paragraphs  et seq. were relied upon by way of analogy in support of that proposition. Lord Davidson submitted that on a proper construction of sections 6 and 7 and Schedules 1, 2 and 3 neither of these obligations were obligations governed by section 6. They were both obligations to which the long‑stop 20 year prescriptive period (section 7) applied. In relation to a trustee’s liability to account for trust funds reference was made to Cockburn v Clark 1885 12 R 707, Moir v Robertson 1924 SLT 435, Collins v EIS Financial Services Ltd 1995 S.C.L.R. 628; and Barns v Barns’ Trs, supra. Obligations of accounting for trust funds were specifically excluded from the obligations of accounting to which section 6 applied (Schedule 1, paragraph 1(f)). The obligation of a trustee to produce accounts was an imprescriptible obligation (Schedule 3, paragraph (e)(i)); and the obligation of accounting for trust funds and a trustee’s obligation to restore to the trust the value of trust property wrongly paid away were obligations which were subject only to the long negative prescription (Johnston, Prescription and Limitation (2nd ed), paragraphs 3.23 to 3.29, and 6.31). The trust purposes here had been to pay the money to WBP (cf. The Mortgage Corporation v Mitchells Roberton 1997 SLT 1305). The money had been paid away to others in breach of trust. The obligation of a trustee to restore to the trust the value of property wrongly paid away was not an obligation to make reparation to which s. 6 applied: Hobday v Kirkpatrick’s Trustees, supra; Johnston, supra, paragraph 6.26. Turning to section 11(3), it was common ground that the onus lay upon the pursuer to obtain the benefit of the subsection. The parties differed as to the date when the pursuer actually became aware that it had suffered loss. The pursuer avers that it did not become so aware until August 2012. Mr Duncan submitted that averment could not be taken at face value in light of other averments which the pursuer made. Standing what it had been told by KPMG and by Mr King the pursuer was aware by January 2008 that it had suffered loss. The fact that it was told and understood that the loss had been repaid and made good was neither here nor there. It knew that, until the supposed repayment, losses had been incurred. It was irrelevant that the losses might have been reversed thereafter: Jackson v Clydesdale Bank plc 2003 SLT 854. In response Lord Davidson submitted that while the pursuer’s averments demonstrated knowledge by January 2008 that there had been an element of fraud down‑stream affecting purported loans between first‑level SPVs (including WBP) and second‑level SPVs, there had been no knowledge that the loans by HC to first‑level SPVs such as WBP were affected. It had not been apparent then that HC had sustained any loss. In relation to constructive awareness the pursuer avers that it could not with reasonable diligence have become aware that loss, injury or damage had occurred until February 2011 at the earliest. Mr Duncan maintained that, once again, it was difficult to reconcile the pursuer’s averment about the earliest date for constructive knowledge with its averments about the earlier knowledge which the non-executive directors had obtained from KPMG and Mr King. In some respects the pursuer’s pleadings were uncandid. In particular, the pursuer did not admit the terms of the letter of 4 January 2008 from KPMG or provide any explanation of the steps, if any, taken in response to its contents. That letter had made it very clear how serious the need for further investigation was, and that the further investigation required to be put in train by the pursuer. The pursuer’s averments of reasonable diligence by it were vague. For the period after 4 January 2008 there was no adequate explanation of precisely what was done and when it was done. This was not the type of case where the sort of bald averments which the pursuer made could ever be sufficient (Beverage & Kellas WS v Abercromby 1997 SC 88; Heather Capital Limited v Burness Paul LLP  CSOH 150; Paragon Finance plc v DB Thackerer  1 All ER 400). In response Lord Davidson submitted that in Cond. 5 and Cond. 19 the pursuer had set out a relevant case for inquiry that February 2001 was the earliest date for constructive awareness. In Heather Capital Limited v Burness Paul LLP, supra, Lord Tyre had gone too far too fast in dismissing the pursuer’s case. It could not be said at this stage that the pursuer had not done what an ordinary person would have done in all the circumstances: Glasper v Rodger 1996 SLT 44; Adams v Thorntons WS 2005 1 SC 30. While on record the pursuer’s response to the defenders’ averments concerning the despatch and terms of the KPMG letter of 4 January 2008 were met with a general denial, Lord Davidson accepted that the letter had indeed been received by the pursuer shortly after it was sent. The lack of any appropriate response to the defenders’ averments about the letter had been an oversight. He suggested that was regrettable but not of major importance, because all of the matters raised in the letter had in fact been addressed by the pursuer elsewhere in its pleadings. The information which the pursuer had from KPMG had not pointed to the need for the pursuer to carry out further inquiries of its own. The pursuer’s averments invoking reliance upon section 6(4) are contained in Cond. 39. Mr Duncan submitted that they were irrelevant. First, there was no relevant averment of error. The pursuer appeared to rely upon the existence of a duty on the part of the defenders to advise the pursuer about a possible claim against them, but there was no such duty (Heather Capital Limited v Burness Paull & Williamson LLP, supra, per Lord Tyre at paragraphs 33-35). Nor were there relevant averments that the error was induced by “conduct” of the defenders. That word should be given its ordinary meaning, which was positive actings. A pure omission was not “conduct” within the meaning of that term in section 6(4)(a)(ii): Johnston at paragraph 6.126, Trustees of Rex Proctor & Partners Retirement Benefits Scheme  CSOH 83, at paragraph 207, and Heather Capital Limited v Burness Paull & Williamson LLP, supra, per Lord Tyre at paragraph 34. No assistance was to be gained from looking at particular statutory definitions of conduct applying to very different contexts from the present one. The onus in relation to the proviso lay on the pursuer, just as it did in relation to all the other requirements of section 6(4). Section 6(4) was an exception to the general rule set out in section 6(1) and it was for the pursuer to bring itself within the exception. Properly read, Lord Penrose’s observations at paragraphs 33 and 66 of Adams v Thorntons WS were authority to that effect. Those observations formed part of the ratio of the decision and were binding on the Outer House whether or not the court took the view that they conflicted with the observations of Lord Millett at paragraph 110 of BP Exploration Operating Co ltd v Chevron Transport (Scotland) 2002 SC (HL) 19. In any case, the issue of onus was immaterial in the present case. The pursuer’s averments as to reasonable diligence were irrelevant to instruct a case under section 11(3) for postponing the running of the prescriptive period, and the same averments were equally irrelevant to instruct a case that the proviso was satisfied. Lord Davidson submitted that the pursuer’s averments were sufficient to satisfy the requirements of section 6(4)(a)(ii). An error had been identified. If I understood him correctly, there was error as to whom the funds in the defenders’ client account were remitted by them and error as to whether the pursuer had a possible right of action against the defenders. The ordinary meaning of the word “conduct” was sufficiently wide to include an omission to act where, as here, the debtor owed the creditor a duty to act. Construing “conduct” as being limited to positive acts was an unduly restrictive interpretation. The tentative views to the contrary expressed in Johnston at paragraph 6.126, in Trustees of Rex Proctor & Partners Retirement Benefits Scheme, supra, at paragraph 207 (by me), and by Lord Tyre in Heather Capital Limited v Burness Paull & Williamson LLP, supra, at paragraph 34 should not be followed. It was worth noting that in other statutory contexts “conduct” had not been restricted to positive acts (see e.g. Companies Act 2006, section 239(5); Financial Services (Banking Reform) Act 2013, section 68(4); Counter‑Terrorism and Security Act 2015, section 14); and that in R v Rai (Thomas)  1 Cr. App. R 242 the expression “words or conduct” had been held to include circumstances where a person failed to inform a building authority that building works no longer needed to be carried out. A broad view was to be taken when considering what the subsection required (BP Exploration Co Ltd v Chevron, supra, per Lord Hope at paragraph 31, Lord Clyde at paragraphs 66-67, Lord Millet at paragraph 97). The subsection was not to be construed restrictively (Dryburgh v Scotts Media Tax Ltd 2014 SC 651, per the Opinion of the Court delivered by Lord Drummond Young at paragraph 20). The onus of satisfying the requirements of section 6(4)(a)(ii) rested upon the pursuer; but that was not so in relation to the proviso to section 6(4). It was for the defenders to invoke the proviso and it was for them to demonstrate that time should not be included in the period of error (BP Exploration Operating Co ltd v Chevron Transport (Scotland), supra, per Lord Millet at paragraph 110; United Central Bakeries v Spooner Industries Limited  CSOH 150, per Lord Hodge at paragraph 117; Johnston, supra, at paragraphs 6.109 and 6.107). Read in context, Lord Penrose’s observations at paragraphs 33 and 66 of Adams v Thorntons WS, supra, ought not to be read as saying anything different. If Lord Penrose was to be read as stating that the onus in relation to the proviso lay on the creditor that was contrary to BP Exploration Operating Co ltd v Chevron Transport (Scotland), supra. If that was indeed what Lord Penrose said it did not form part of the ratio of the decision, and it should not be followed. In any event, if, contrary to the pursuer’s submission, the onus in relation to the proviso was on the pursuer, the averments of reasonable diligence made by it anent section 11(3) were also sufficient to make out a case under the proviso which was suitable for inquiry. Finally, Mr Duncan submitted that the court should look at the averments which the pursuer had made in Heather Capital Limited v Burness Paull & Williamson LLP, supra. In that case it had averred that Burness had had actual knowledge of instructions given to them to transmit funds to Mr Levene but did not report it to the pursuer. Mr Duncan submitted that the knowledge that Burness had should be imputed to the pursuer in the present action because Burness had been HC’s agent (Chapelcroft Limited v Invergordon Egg Producers Limited 1973 SLT (Notes) 37; Adams v Thorntons WS, supra; Blackburn Low & Co. v Vigors (1887) 12 App Cas 531; Muir's Executors v Craig's Trustees 1913 SC 349; Johnston, supra, at paragraph 6.89). If that was correct it would fix the pursuer with knowledge alerting it to the alleged fraud more than five years before the present action was raised, and there could be no question of either section 6(4) or section 11(3) saving the claim from prescription. In reply Lord Davidson resisted the contention that Burness’ knowledge fell to be imputed to the pursuer in the present case. Burness had been used by Mr King in the perpetration by him of the fraud. It would be ludicrous and unconscionable in those circumstances to impute Burness’ knowledge to the pursuer for the purposes of the present action. If the defenders’ plea of prescription is to be sustained without inquiry into the facts the court needs to be satisfied that even if the pursuer establishes all the facts which it avers the obligations it founds upon have prescribed. Counsel made reference to the pre‑1973 Act law concerning the prescription of obligations of trustees. I did not understand it to be disputed that prior to the 1973 Act obligations of trustees to account for trust property, or to restore the value of trust property disposed of in breach of trust, prescribed under the long negative prescription (see eg Barns v Barns’ Trs, supra, and the cases there discussed; and the Scottish Law Commission Report no 15, Reform of the Law Relating to Prescription and Limitation of Actions, Part III, paragraphs 23-27, for a brief general summary of the previous law). The issues of prescription which arise before me are governed by the 1973 Act. While the excursus to the former law was not without interest, ultimately it has not assisted me in reaching the conclusions which I have reached. The law relating to accounting for trust funds appears to me to be clear. The short negative prescription applies to ordinary obligations of accounting, but it does not apply to obligations of accounting for trust funds (1973 Act, Schedule 1, paragraph 1(f)). The obligation of a trustee to produce trust accounts is an imprescriptible obligation (Schedule 3, paragraph (e)(i)). The liability is enforceable by means of an action of count, reckoning and payment (Johnston, supra, paragraph 3.28). On the other hand, the liability to make payment of the sum due in an accounting for trust funds is neither imprescriptible nor is it subject to the short negative prescription. It is governed only by the long negative prescription (1973 Act, section 7(2); Johnston, supra, paragraphs 3.23 to 3.29, 6.31; Russell, Prescription and Limitation of Actions (7th ed), pages 73-74, 115). On its averments the pursuer’s primary case is for an accounting for trust funds. The defenders dispute that they held the relevant funds as trustee, but that is a matter which cannot be resolved on the pleadings. Given that they deny the existence of a trust and of a liability to account for trust funds, it is difficult to see that they can maintain that they have produced trust accounts: and that is certainly not the position on the pursuer’s averments. The obligation founded upon in the primary case does not bear to be an obligation to make reparation for breach of trust (Schedule 1, paragraph 1(d)) or an obligation arising from, or by reason of any breach of, a contract or promise (Schedule 1, paragraph 1(g)): and I am not persuaded that at a debate ‑ where the pursuer’s averments require to be taken pro veritate - the court can or should re-characterise the obligation upon which the pursuer founds and treat it instead as if it were an obligation of a different nature. In my opinion the pursuer’s averments as to the existence of a trust and of an obligation to account for trust funds are sufficient to entitle it to inquiry. It cannot be said that the pursuer is bound to fail (or that the defenders’ prescription plea is bound to succeed) even if the pursuer establishes all it avers. As an alternative to an accounting for trust funds the pursuer seeks restoration of the value of trust property paid away in breach of trust. The third conclusion and the sixth plea‑in‑law somewhat confusingly refer to “recompense”, but it is clear from the pursuer’s averments in Cond. 29 and 39 that restoration to the trust is what is sought. In my opinion a trustee’s obligation to restore the value of trust property to the trust is not an obligation to which the short negative prescription applies. I am not persuaded that Hobday v Kirkpatrick’s Trustees, supra, was wrongly decided. I agree with Lord Cowie (1985 SLT 197, at page 199) that an obligation of that nature is not an obligation arising from liability to make reparation within the meaning of paragraph 1(d) of Schedule 1 (see also Johnston, supra, paragraph 6.26). Rather, it is an obligation to which only the long negative prescription applies (section 7(2)). I am not persuaded that it is possible to distinguish the present case from Hobday without any inquiry into the facts. Mr Duncan’s first suggested ground of difference was that here the court could and should treat the obligation to restore the value of trust property to the trust as if it were a mere contractual obligation or an obligation arising by reason of breach of contract. However, that is not the nature of the obligation upon which, on averment, the pursuer founds; and without establishing the facts I see no proper basis for proceeding as if it was. Even if Lord Reed’s observations in AlB Group (UK) plc v Mark Redler & Co Solicitors, supra, had tended to support Mr Duncan’s suggested approach I would have been very hesitant indeed to treat observations on the English law of equitable compensation as being transferable to the Scots law of trusts: but in my opinion the observations do not assist Mr Duncan. On the contrary, Lord Reed was at pains to distinguish claims for damages from claims for equitable compensation (see e.g. paragraphs 134, 137). The second suggested ground of difference was that if the obligation here was not an obligation to make reparation it was an obligation arising from, or by reason of a breach of, a contract or promise and that it fell within Schedule 1, paragraph 1(g). But prima facie the obligation to restore the value of trust property to the trust upon which the pursuer founds is an obligation of a different character from the obligations described in Schedule 1, paragraph 1(g) (cf. AlB Group (UK) plc v Mark Redler & Co Solicitors, per Lord Reed at paragraph 137). Once again, in my opinion the pursuer’s averments of trust and of an obligation to restore the value of trust property are suitable for inquiry. It cannot be said that the pursuer is bound to fail (or that the defenders’ prescription plea is bound to succeed) even if the pursuer establishes all it avers. At the debate the pursuer proceeded on the basis that each of the remaining alternative cases advanced by it (viz claims for damages for breach of trust, breach of contract, fault and negligence, breach of fiduciary duties, and dishonest assistance) was subject to the short negative prescription. I understood the pursuer to accept that these claims for damages will have been extinguished unless (in terms of section 6(4)) a period of time is not to be reckoned as part of the prescriptive period, or the commencement of the prescriptive period was postponed (by virtue of section 11(3)). I am not persuaded that I can determine on the pleadings that the pursuer had actual awareness that it had suffered loss more than five years before the action was raised. It avers it was not aware that it had suffered loss until a date later than five years before the action was raised. I require to take that averment pro veritate unless other averments made by the pursuer are plainly inconsistent with it and clearly show actual awareness at an earlier date. I am not satisfied that there are any such averments. As a result of the events of 2007 the pursuer became aware (i) that substantial sums lent by it to first‑level SPVs, including the £19 million and the £9.412 million, had not been on‑lent by first level SPVs to second‑level SPVs; (ii) that instead it had been transferred to other unknown recipients for unknown purposes; (iii) that there had been no valid security granted to first‑level SPVs in relation to the transfers to such recipients; (iv) that the loan and security documentation relating to the purported transactions with second‑level SPVs was invalid; (v) fraud had been involved; (vi) Mr King had alleged to the non-executive directors of the pursuer that Mr Volpe and Cannons had been responsible for the fraud; (vii) that the pursuer had received via Cannons sums tendered as repayment of each of the loans to SPVs including the two purported loans to WBP. In my opinion none of those matters are clearly indicative of awareness that loss had been sustained. The pursuer’s position is that until 2012 it believed that each loan made by it had been duly advanced to the intended first‑level SPV and that the debenture granted by the first‑level SPV when the credit facility agreement with it was concluded would secure the loan; that each of its loans to SPVs had been repaid in about May 2007; and that the irregularities which had been discovered had all been “downstream” in relation to on‑lending by the first‑level SPVs. On the other hand I am persuaded that the pursuer’s averments do not adequately explain why it could not with reasonable diligence have discovered that it had suffered loss more than five years before the action was raised. The letter of 4 January 2008 from KPMG made it very clear how serious the need for further investigation was, and that that further investigation required to be put in train by the pursuer. I do not accept Lord Davidson’s contention that all of the matters raised in that letter had in fact been addressed by the pursuer elsewhere in its pleadings. Nowhere does the pursuer acknowledge (i) that it was advised by KPMG that it was its obligation to take the actions needed to remedy the weaknesses which had been identified; (ii) that it was advised that KPMG’s routine audit work was designed to enable it to form an audit opinion on the accounts of the companies and that that work should not be relied upon to disclose all irregularities that may exist; (iii) that as at 4 January 2008 KPMG recommended that the Board of HC continue their investigation into the fraudulent loan and security documentation and formally document their decision as to whether or not to inform the criminal justice authorities; (iv) that KPMG recommended that the Board of HC continue their investigation into the misapplication of funds for an unknown purpose and minute their actions and conclusions. The report makes it crystal clear that further investigations were required and were recommended in relation to those matters. “Cond. 5 … Thereafter all avenues of enquiry were considered to have been pursued by HC’s board of directors, including discussing matters with the FSC and making a disclosure to the FCU; meeting with KPMG to discuss how the issue could be further investigated; obtaining legal advice; and seeking to obtain further information from inter alia Gregory King, Santo Volpe and Triay & Triay. These enquiries amounted to reasonable diligence in the circumstances of this case. HC’s board of directors, Abacus and KPMG believed that whilst there had been irregularities with the securities granted by the Second Level SPVs and as explained in the letter from Gregory King to the board of directors of HC dated 26 November 2007 that “some form of fraud had been deliberately introduced with invalid land registry details”, the funds advanced had been repaid in full, with interest, and HC had not suffered a loss. HC’s board of directors’ understanding was supported by KPMG’s investigations. KPMG verified HC’s accounts as reflecting a true and fair view of the HC’s financial conditions. This remained KPMG’s position in subsequent reports. In these circumstances, the board of directors of HC were not, and could not with reasonable diligence, have been aware that HC had suffered a loss until after the appointment of the Liquidator. The true destination of these funds was confirmed on 31 August 2012. From the date of his appointment the Liquidator (assisted by staff from the Fraud Investigations and Dispute Service at Ernst & Young LLP) sought to reconstruct HC’s affairs and so account for the losses HC and its investors sustained. This process of identifying the destination of the funds commenced in February 2011. This included a detailed review of electronic documentation recovered from various sources. In around June 2012, the Liquidator’s team identified documents which indicated that the payments to WBP had not been on lent to the Second Level SPVs but had instead been paid to Niblick and Hassans. This was only confirmed on 31 August 2012, when the First Defender produced copies of its client ledger to the Liquidator as part of a response to a request for information made by the Liquidator under section 236 of the Insolvency Act 1986. The ledger produced showed that the funds paid to the defenders by HC had been paid to Niblick and to Hassans. There are a number of problems with the pursuer’s approach. First, the averments in Cond. 5 that KPMG “verified HC’s accounts as reflecting a true and fair view of the HC’s financial conditions.”, and that “… KPMG believed that … the funds advanced had been repaid in full, with interest, and HC had not suffered a loss.”, and the averment in Cond. 39 that “Accordingly, the auditors had informed the relevant board of directors of HC that no loss had occurred and confirmed that position in subsequent years.” at best place a very favourable gloss on the facts given the qualifications in the accounts to 31 December 2006 and 30 September 2007 (which qualifications were referred to in the accounts for the year to 31 December 2007 signed on 6 June 2008) and the very serious concerns expressed in the letter of 4 January 2008. Second, the question is whether the pursuer could not with reasonable diligence have become aware that it had suffered any material loss (not necessarily the full extent of the loss actually suffered). Third, and critically, the pursuer’s averments setting out what it did in the exercise of reasonable diligence appear to me to be vague and unspecific. The averments do not explain precisely what the pursuer did and when it did it. In my opinion in the circumstances of the present case that simply will not do. In light of the issues raised in the defenders’ averments it was incumbent upon the pursuer to specify in detail each of the steps which it took after receipt of the letter of 4 January 2008. It ought to have explained what, if anything, it did to comply with the recommendations in that letter; and if it did not comply with the recommendations it ought to have explained why it did not. The pursuer has conspicuously failed to do any of those things. All that it proffers are vague general averments which provide no real detail as to what was done and when it was done. In my opinion the pursuer has not discharged the onus upon it of making relevant and specific averments setting out a basis for establishing that it could not with reasonable diligence have been aware that it had suffered loss more than five years before the raising of the action. It has not made relevant and specific averments which if established would show that it took the steps that a person of ordinary prudence would have taken if he found himself in the circumstances which the pursuer did. Accordingly, since in order to obtain the benefit of section 11(3) the pursuer requires to demonstrate both that it was not aware and that it could not with reasonable diligence have been aware that relevant loss, injury and damage had occurred, its averments that the running of the prescriptive period was postponed in terms of section 11(3) are irrelevant. The averments do not specify with the clarity one would expect the error upon which the pursuer founds. The formulation used is not commendable. More precise pleading could have avoided the complaint of obscurity. However, on a benign reading I think it is tolerably clear that error having two strands is identified ‑ error as to whom the funds in the defenders’ account were remitted by them and error as to whether the pursuer had a possible right of action against the defenders. While no date of commencement of the error is specified, it may reasonably be inferred that the pursuer’s case is that the error arose shortly after each of the £19m and £9.412m payments were remitted by the defenders to the recipients. The pursuer does aver an end date for the error (the date of raising of the action (23 October 2014)), but that is obviously not correct as it also avers (Cond. 5) that the true recipients of the payments were confirmed on 31 August 2012. However, in my opinion that relatively immaterial inconsistency is not a good ground for not proceeding to inquiry. Are the failures to advise as to whom the payments were remitted and as to the existence of a possible right of action “conduct” within the meaning of section 6(4)(a)(ii)? That depends on whether a failure to act may be “conduct”. For this reason, and owing to the relief available under section 11(3), it may be better to assume that omissions inducing error may not suspend the running of prescription but that they will be capable of supporting an argument for postponing its starting date. 254 For example, where the negligent failure of solicitors to notify the appointed executor of the existence or contents of the will prevented him from raising any proceedings until he was belatedly informed of those facts: Hawkins v Clayton (1988) 164 C.L.R. 539 at 590, per Deane J.
Lord Penrose went on to hold that on the facts found by the Lord Ordinary the obligation founded upon had prescribed. While in the circumstances of that case silence was said to have been associated with positive advice and actings, it is not clear that was critical to Lord Penrose’s view that the matter might have been of some materiality. I turn to the more recent decisions. In Trustees of Rex Proctor & Partners Retirement Benefits Scheme, supra, I agreed (at paragraph 207) with the view expressed in Johnston that on an ordinary construction “conduct” requires a positive act. In Heather Capital Limited v Burness Paull & Williamson LLP, supra, (at paragraph 34) Lord Tyre concurred with the views expressed in Johnston and by me in Rex Proctor. In neither case does there appear to have been extensive submissions in relation to the matter. On a fair reading of the pursuer’s averments in Cond. 39 it maintains that the defenders had an obligation to advise it of the true sequence of events which led to the loss of the funds and that there was a possible claim against them (cf. Rex Proctor, paragraph 207). On the pleadings I am not satisfied that the pursuer is bound to fail to establish the grounds of action he puts forward, or that those grounds could not provide a basis for the obligation to advise it which the pursuer avers the defenders had (see eg Dryburgh v Scotts Media Tax Ltd, supra, per Opinion of the Court at paragraph 26). In the present case, unlike Heather Capital Limited v Burness Paull & Williamson LLP (paragraph 35), my understanding is that the duty to advise is said to have arisen on several of the bases of action on which the pursuer relies. (I also note in passing that I was unconvinced by Mr Duncan’s argument (which Lord Tyre accepted) that the existence of a continuing duty to advise would prevent prescription from ever occurring. The operation of the proviso would be likely to prevent any such scenario). “Manner of conducting oneself or one’s life; behaviour; usually with more or less reference to its moral quality (good or bad). (Now the leading sense)”. In my opinion, on a proper construction of section 6(4) the word “conduct” has its ordinary meaning of behaviour. The expression is wide enough to include an omission to act in breach of an obligation or duty. It is very difficult to see why it should be given a more restrictive meaning, particularly since it is clear that a broad view is to be taken to the construction of section 6(4) (BP Exploration Co Ltd v Chevron, per Lord Hope at paragraph 31, Lord Clyde at paragraphs 66‑67, Lord Millet at paragraph 97; Dryburgh v Scotts Media Tax Ltd, supra, Opinion of the Court at paragraphs 18 ‑ 20). Resort to the mischief rule points in the same direction. The mischief the error provision was intended to address is broad enough to encompass error induced by a failure of the debtor to act in breach of an obligation or duty. A construction of “conduct” which confined it to positive acts would fail to address part of the mischief. It would be very odd indeed if innocent action inducing error fell within the purview of the provision but reprehensible inaction in breach of duty did not. The equitable case for the latter circumstance being included within the scope of the mischief, and within the meaning of “conduct”, is as strong as the case for reprehensible action being included and stronger than the case for innocent action being included. While strictly speaking the pursuer does not respond specifically to that averment other than by way of a general denial, both parties proceeded upon the basis that the pursuer’s averments anent section 11(3) were also the matters which it founded upon in response to the defenders’ reliance upon the proviso to section 6(4). It is a well‑established principle of statutory construction that a party seeking to avail himself of a proviso must raise and prove it, as it is in substance an exception (see Bennion on Statutory Interpretation (6th ed. ), section 242 and the authorities referred to in footnote 71). Exceptionally, a provision may be in the form of a proviso but may in fact be an independent substantive provision (ie not a “true” proviso). I am satisfied that that is not the case here. I am also clear that, on a proper construction of section 6, subsection (4)(a) is an exception to the general rule in subsection (1) but that the proviso is an exception to that exception. While none of the other members of the appellate committee addressed the issue of the operation of the proviso, none expressed any reservations as to what Lord Millet said in paragraph 110 (and at paragraph 33 of his speech Lord Hope made specific reference to, and agreed with, another aspect of Lord Millet’s speech). Moreover, in my opinion when the pleadings and the decision are examined it is clear that the committee must indeed have proceeded upon the basis which Lord Millett described. A vessel had caused damage to loading arms at a jetty at the pursuers’ terminal. The pursuers raised an action against Chevron Shipping (“Shipping”) averring that that company were owners of the vessel. The pursuers averred that more than five years after the incident Shipping indicated that the owners were Chevron Tankers (“Tankers”). The pursuers raised a second action against Tankers. In their defences Tankers admitted ownership but averred that the vessel had been the subject of a bareboat charter and that the charterers were Chevron Transport (”Transport”). In both the Transport action and Tankers action the defenders pled that the obligation (to make reparation) relied upon had prescribed. In both of those actions the pursuers averred that error as to ownership had been induced by the words and conduct of Shipping acting on the defenders’ behalf. In both cases the defenders invoked the proviso to section 6(4)(a). The defenders averred that the pursuers could with reasonable diligence have discovered the error within five years of the incident. They set out steps they averred ought to have been taken by the pursuers. They averred that letters of protest written to the pursuers after the incident by the master of the vessel alerted them to the true identity of the owners. In each case the pursuers denied that they could with reasonable diligence have discovered the error more than five years before the action was raised. In the Tankers case the pursuers averred that they had no reason to disbelieve what Shipping had told them as to ownership; that in the circumstances reasonable diligence did not require seeking verification; and that no indication of the true identity of the owners had been given in any of the letters of protest. In the Transport case the pursuers did not positively aver that they could not with reasonable diligence have discovered the error within five years of the incident: but in response to the defenders’ averments they averred that they had had no reason to disbelieve Shipping; and that even if they had doubted what Shipping said they could not have ascertained by reference to any public register that Transport were bareboat charterers. The Lord Ordinary allowed a proof before answer in relation to all three actions. The First Division sustained the plea of prescription in the action against Transport and allowed a proof before answer in the other two actions. The House of Lords recalled that interlocutor and allowed a proof before answer in all three cases. In my opinion, since in the Transport case the pursuers did not positively aver that they could not with reasonable diligence have become aware of their error within five years of the incident, their Lordships must have proceeded on the basis that it was not incumbent upon the pursuers to do so. The views expressed in Johnston at paragraphs 6.109 and 6.107 accord with those of Lord Millett and Lord Hodge. Lord Marnoch and Sir David Edward concurred that the reclaiming motion should be refused. Each reserved his opinion in relation to the more difficult points of construction of section 6(4) and section 11(3) which had been argued but did not require to be decided (paragraphs 1 ‑ 3, 76). In these circumstances I have considerable doubt whether it is correct to say that Lord Penrose ruled on where the onus lay in relation to the proviso. In my opinion Mr Duncan seeks to read too much into paragraphs 36 and 66 of Lord Penrose’s Opinion. The context was a reclaiming motion following a preliminary proof where the Lord Ordinary had made findings in fact. In view of the facts found the question of onus in relation to the proviso was immaterial. Onus in relation to the proviso was not a matter the Inner House needed to consider, and there is no indication that it had the benefit of submissions on the point. Had Lord Penrose really intended to express a view at odds with Lord Millet’s I would have expected him to acknowledge that and to explain his reasons for disagreeing. He did none of that. In fact, while he referred to several passages in BP Exploration v Chevron he made no reference to paragraph 110. If, contrary to my view, Lord Penrose falls to be read as holding that the onus in relation to the proviso is on the creditor, I do not accept Mr Duncan’s submission that I am bound to follow Lord Penrose on that point. In my opinion if that was indeed what Lord Penrose said it does not form part of the ratio of the decision. I consider that I am free to follow BP Exploration v Chevron Transport (Scotland) and Lord Hodge in United Central Bakeries v Spooner Industries Limited, and I am satisfied that I should do so. Accordingly, in my view it is for the defenders to establish that the proviso applies so as to exclude a period from the period of error founded upon by the pursuer. This is important because, even though I am of the view that the pursuer’s averments in relation to its reliance on section 11(3) are not adequate to set forth a case that it could not with reasonable diligence have been aware that relevant loss, injury or damage had occurred more than five years before the action was raised, it does not necessarily follow that the defenders will succeed in discharging the onus upon them of establishing that the pursuer could with reasonable diligence have discovered the error upon which it founds at a date earlier than the pursuer in fact discovered it. In my opinion the pursuers’ averments in relation to section 6(4) are suitable for inquiry. Since inquiry is necessary in relation to the pursuer’s averments concerning section 6(4), and since the issues relating to reasonable diligence in connection with section 6(4) and section 11(3) would be likely to cover similar ground, I have considered whether I should simply allow inquiry in relation to both of those issues. In my opinion it would not be right to be swayed by that consideration. The pursuer has failed to discharge the onus upon it of pleading a relevant section 11(3) case. It would be wrong to ignore that and to allow the pursuer to elide the consequences of that failure. The short answer to Mr Duncan’s “imputed knowledge” submission is that the hearing before me was to debate the relevancy of the pursuer’s pleadings in this action. Nowhere in those pleadings does the pursuer aver knowledge on the part of Burness of the matters upon which Mr Duncan seeks to rely. That is sufficient to deal with the submission. At a preliminary proof on prescription it will be a matter for proof whether Burness had the relevant knowledge; and, if they did, it will be a question of law having regard to the whole circumstances established at the preliminary proof whether that knowledge falls to be imputed to the pursuer; and, if so, for what purposes. Mr Duncan attacked the relevancy of the pursuer’s pleadings in a number of respects. Ultimately he accepted that some points were not capable of being determined at debate: it is unnecessary to mention them. So far as the remainder are concerned, while the criticisms had been set out at length in the defenders’ note of argument Mr Duncan acknowledged that the principal issue for debate was whether the defenders’ plea of prescription could be sustained at this stage or whether a preliminary proof on prescription was required. Since that was so he dealt briefly with the additional submissions. In short these were (i) that the pursuer did not have relevant averments of a solicitor-client relationship between it and the defenders in relation to the payments of £19 million and £9.418 million, nor were there relevant averments as to the scope of the retainer; (ii) that the pursuer’s averments that it had sustained a loss were irrelevant; (iii) that on the hypothesis that the pursuer was not the defenders’ client the averments (a) that the payments had been held by the defenders in trust for the pursuer were irrelevant, (b) that the defenders owed the pursuer fiduciary duties were irrelevant; (iv) that the pursuer’s averments that the defenders owed the pursuer a delictual duty of care were irrelevant; and (v) that certain of the pursuer’s averments involved collateral matters and were irrelevant. I too consider it possible to deal briefly with these submissions. So far as matters (i) to (iv) are concerned I am not persuaded that the pursuer’s averments are insufficient to entitle it to inquiry. I am not satisfied that the pursuer is bound to fail to establish that the defenders acted as its solicitors when it received the payments, and that they breached the duties they owed to it, even if it succeeds in proving all its averments relating to those matters (Jamieson v Jamieson 1952 SC (HL) 44). Similarly, I am not satisfied that if the pursuer proves its averments it will fail to prove that it has suffered a loss; or that it is bound to fail to establish that the defenders owed it the fiduciary duties condescended upon; or that it is bound to fail to establish that the defenders owed it a delictual duty of care. The averments said to be collateral are averments of links between the eighth defender and companies controlled by Mr King; and averments that in December 2008 an unexplained payment of £200,000 was made to the eighth defender from the same Rosecliff Limited client account at Hassans into which the £9.412 million had been paid by the defenders. Mr Duncan submits that since none of this pre-dates either of the dates when the pursuer’s loss was sustained (in January and March 2007) it can have no possible bearing upon any of the pursuer’s grounds of action, and that it is simply “mud‑slinging”. The averments complained of serve to give notice to the defenders of the pursuer’s intention to explore these matters at proof. The defenders offer no explanation as to why the £200,000 payment was made, nor do they clarify whether or not its source was the £9.412 million. If its source was the £9.412 million then part of a sum which the pursuer avers was paid away in breach of trust was in fact returned to the eighth defender. Moreover, the acceptance of the £200,000 payment and the eighth defender’s roles or involvement with Mr King and his companies in a period soon after the two payments might be relevant to the question what, if anything, the defenders ought to have advised the pursuer between the date of the payments and the pursuer discovering where they had gone. The matters said to be collateral might raise issues of judgement or probity which, arguably, could be relevant to the credibility and reliability of the eighth defender. Having regard to the whole circumstances which the pursuer avers on record I am not satisfied that I can conclude at this stage that the averments complained of are necessarily collateral and irrelevant. With the exception of its section 11(3) case, the pursuer’s averments are suitable for inquiry. A preliminary proof on prescription appears to me to be the appropriate way forward. However at counsel’s request I shall put the case out by order to discuss the terms of an appropriate interlocutor to give effect to my decision, and to discuss further procedure. I recognise that a number of my conclusions do not coincide with Lord Tyre’s conclusions in the case of Heather Capital Limited v Burness Paull & Williamson. We have reached the same result on the pursuer’s section 11(3) case (even though the pursuer’s averments in that regard in the present case were somewhat fuller than those considered by Lord Tyre). Some of the matters which I have had to decide are issues which Lord Tyre does not appear to have been asked to consider. In Burness Paull it seems that the pursuer did not argue that the obligation of accounting for trust funds and the obligation to restore the value of trust property to the trust were obligations to which the short negative prescription did not apply. In relation to other matters - in particular section 6(4) ‑ I may have had the advantage of hearing arguments which were either additional to, or more fully developed than, the submissions made to Lord Tyre. Be that as it may, ultimately there is no escaping the fact that we have reached different conclusions on at least three material matters, viz (i) whether there are relevant averments of error; (ii) whether there are relevant averments of conduct by the defenders inducing the error; and (iii) whether the onus of averment and proof in relation to the proviso rests with the creditor or debtor in the relevant obligation. I like the way you included Mulholland not taking the big decision then leaving Crown and being promoted to the bench by Carloway. WE revealed last week how Lord Advocate's brother Iain Mulholland was at centre of a dirty money probe after arranging a £550k mortgage for rogue lapdance tycoon Steven MacDonald. Dubai with businessman Frankie “Donuts” Donaldson. Good thing the press are following this otherwise you know..
" On a fair reading of the pursuer’s averments in Cond. 39 it maintains that the defenders had an obligation to advise it of the true sequence of events which led to the loss of the funds and that there was a possible claim against them (cf. Rex Proctor, paragraph 207)"
You would think so as part of the so-called duty of solicitors to their clients! THE fiancé of Pippa Middleton was a major investor in a collapsed company at the centre of a £90million fraud investigation. James Matthews used his Eden Rock Capital Management fund to invest £38million in controversial financier Greg King’s Heather Capital. But Matthews, 40, became concerned within months and tried to pull his investment, leading to two-day mediation talks in Switzerland. The money was returned to Matthews just over three years before Heather Capital collapsed with the loss of £280million of investors’ cash – £90million of which was allegedly stolen. Police launched an investigation after the company collapsed in 2010. Four men were reported to the Crown but none have appeared in court. Fund manager Matthews had invested in Heather Capital because of a mutual association with 47-year-old King’s co-director Santo Volpe, who left Eden Rock to join Heather. But in 2006 Matthews – who announced his engagement to the Duchess of Cambridge’s sister earlier this month – wanted to withdraw, which led to a dispute between the two parties. The discussions, stretching over two days in Geneva, were led by QC Alan Boyle and called in a bid to resolve the dispute over Matthews investment. They list both Matthews and King as having been involved in “formal mediation” and say that the outcome was “successful”. Yesterday, neither responded to requests for comment. A source close to Matthews said: “James is a very proper person and he is simply not in a position to be able to discuss this. “But anyone looking at the facts will see that his decision was the right one. “He became concerned at a lack of transparency and you could say he dodged a bullet by withdrawing. “They thought Heather Capital would make money but they were wary of certain aspects. “Santo left Eden Rock to join Heather Capital at the end of 2005. The mediation talks took place in December 2006 when Heather were still active as a business but by which time the fund’s auditor KPMG had started to raise concerns. A source close to the case said: “It shows how far the scandal around Heather Capital and their connected companies reach. “Matthews was obviously astute enough to divorce himself from any involvement at a very early stage. Companies House records show Volpe was a co-director at Eden Rock in 2003 but resigned his directorship in 2005. Shortly afterwards he became a co-director at Heather. In court papers published nine days ago, Volpe is alleged to have diverted investors’ funds illegally, then tried to conceal the fraud. He and King are accused of compounding the fraud by “taking steps, from March 2007 onwards, to conceal the true use of the funds”. Ernst & Young, based in America, are of course one of the 'big four' accountancy firms and, as your readers may be aware, such firms have interesting histories of their own. The depressing fact that the Crown Office "is yet to act after a three year probe initiated by Wolffe’s predecessor" comes as no surprise, and it seems clear from the summons that Levy McRae - advisors to the SNP elite if I recall correctly - are not the only firm of solicitors with dirty fingers. It will be revealing to follow the progress of this case and see if a deal is done behind closed doors, past history in Scotland's Courts would suggest a "gentleman's agreement" being announced at some point in the future, ot the Court admonishing the defenders and ensuring the profession's dirty laundry is swept under the carpet.......AGAIN. I wouldn't trust the Crown Office one bit on any "probe" they are carrying out.As we all know COPFS are politically motivated in every single decision they take.Just look around at the links some of the personalities in this saga have to top SNP politicians in Scotland.Add to that links going right back to the judiciary.Absolutely no one could ever convince me prosecutors in Scotland will have any motivation to proceed with a trial.If you want any evidence of this just look at what is going on re the multiple mortgages scam case in Glasgow High Court where charges are being dropped by the week and all kinds of sleazy lawyers from the Law Society are being given immunity to squeal on each other.And where the hell are Scotland's robust media on that one I ask?Not a bloody peep on television or in the printed press apart from occasional comments on your blog and the odd remark in newspaper comment sections suspiciously deleted almost as fast as they appear.Couldn't be anything to do with the fact one of the candidates right at the heart of the fraud who made a lot of money out of it has links to the media himself and goes around giving out gongs.Get digging folks! The advice must be avoid Scottish financial products! especially now we know your own law enforcement is part of the problem! With regard to other queries relating to this case please contact the blog or journalists via your choice of communication or other channels. In relation to offers of information please send in or directly to journalists who are covering this story. Well to my mind this throws into doubt the ruling on the Burness case although really one has to wonder if an honest outcome to this can be realised in Scotland given as you say who is all linked to who. Staggering really the time span and chain of events leading to present day and no action taken by any regulatory authority or law enforcement as I note others point out. Also a good decision by you to publish the opinion in full given the haphazard nature of the courts admin on what they allow the general public to read. A bit off topic I know but you should know that Lord Lang, the Chairman of the law society of Scotland's longtime insurer Marsh, has resigned. Doubtless he will take a huge sum by way of a 'golden goodbye', having loyally served his masters and been responsible for preventing the Scottish Public any proper access to justice for some 20 years - he was indicted on 5 counts in the Spitzer investigations into bid rigging among allegedly independent insurance companies.